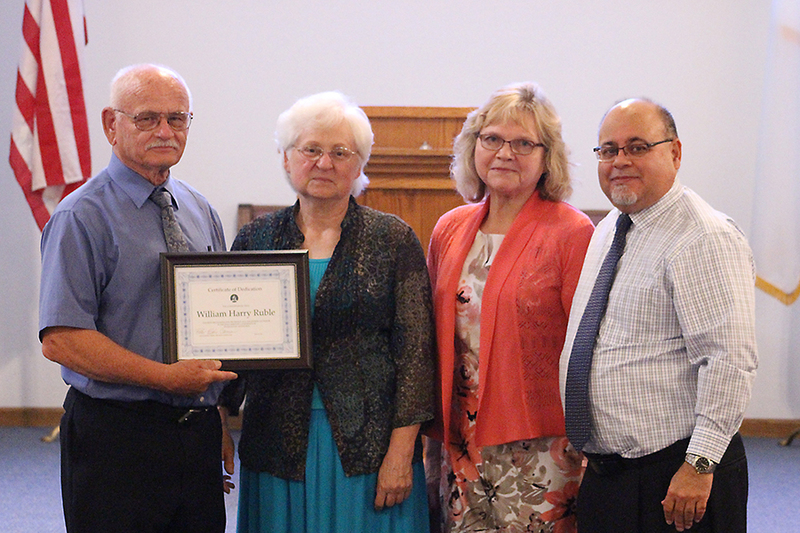 Bill Ruble (left), with wife Carol, is presented with his Certificate of Dedication by Susie and Eddie Cabrera. With just one member still in regular attendance a year ago, the Osceola Church was about to close. That all changed when Bill Ruble entered the picture. He and his wife, Carol, immediately got to work inviting old members back to church and visiting with prospective members, many of whom had previously attended evangelistic meetings but had not joined the church. They also recruited help from others who had been active with them in a home-based church plant for several years prior. After a year of these joint efforts, there are now 25-30 people in regular attendance at the Osceola Church. Bill, who now serves as the church’s volunteer lay pastor, credits its revitalization to prayer. “I often wake up at 2:00 am and pray for help to bring the church back,” he said. On a typical day, Bill gets up around 4:30 am, has worship with Carol, then gets ready and heads to his fulltime job as a school bus driver. He spends the rest of his time giving Bible studies, preparing sermons, gardening and raising pigeons. Bill is one of two lay pastors currently participating in the Iowa-Missouri Conference’s Volunteer Lay Pastor (VLP) program. The program just launched this year and offers resources, mentoring, coaching and training to those who want to plant a church or bring new life to a dying church. Bill plans to hold an evangelistic series this fall. “I hope to see the church grow to the point it was years ago,” he said. “That is going to take a miracle, but I believe in miracles! I will continue to encourage people to come and pray for them.” Beyond raising up a healthy church, Bill also hopes to build up leadership that can one day take his place, when the time comes.